Drag Racing Bike Edition: How To Tune A Level 10 YZF 1000 6.693s 1/4 mile! 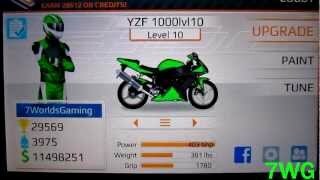 Drag Racing Bike Edition: Level 10 YZF 1000 6.693s 1/4 mile! Lunch: hold down the accelerator! Shift from 1st Gear to 2nd Gear at 12,200RPM! Shift from 2nd Gear to 3rd Gear at Late Green! NOS when right when you shift into 3rd Gear. Shift from 3rd Gear to 4th Gear Late Green! Subscribe & Like this video!